Hope everyone is well and wonderful? The weather here in North Wales has been increasingly getting worse, my heart goes out to all the people who have been flooded or effected by the high winds. So as a broken branch in the garden waves about in the wind threating to fall I will write to you about some of the things that have happened so far this week. Getting back to normal is always a strain after Christmas but its always nice to get the house sorted so that's what I've been doing, going room by room organising (the best I can) in-between school runs and working. I said goodbye to my daughter at the school gates this morning, for her first day back and watched her hug her friends excitedly swapping tales of Christmas presents, I will miss her. I had a lovely surprise in the post today, I've been waiting for what seems like forever! but here it is in all its loveliness. Never at the age of 18 did think I'd get so excited over an oil burner. My friend bought me some melts before Christmas (a very thoughtful gift) so I thought I better get a burner. 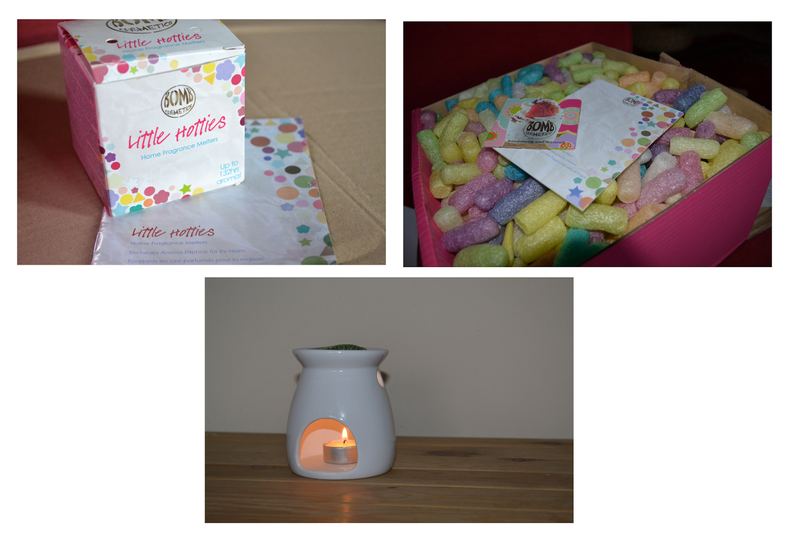 It is great and smells amazing, you can even make up your own scents with different melts or use the menu card to make the ones already tired and tested. I'm really pleased with mine it's much better than the candles I've been using. 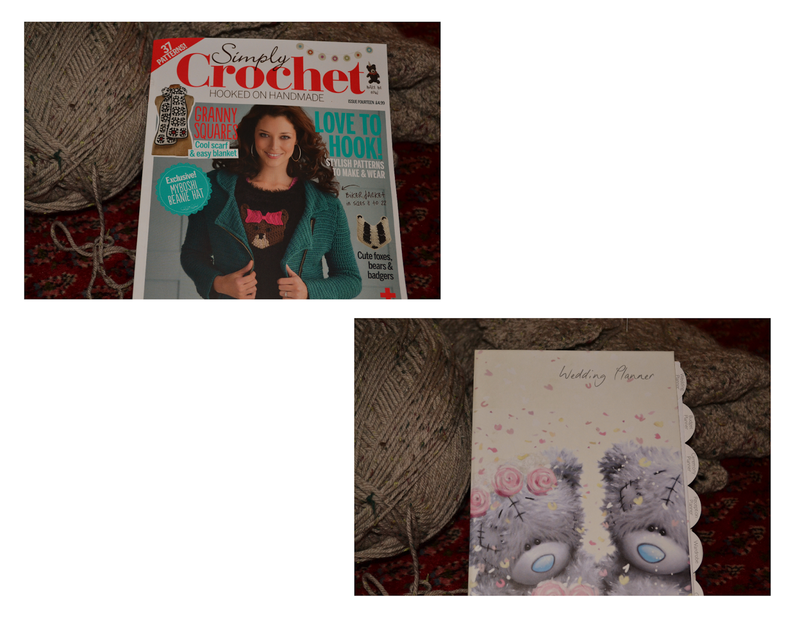 Also this week my first simply crochet arrived through the door (Thank you Mum) a great Christmas present that keeps giving. For those of you who love Attic24 - like me, there is a lovely interview with Lucy among other great items. I've been making a start on organising our wedding, my lovely friend bought me this wedding organiser which she said really helped her when organising her wedding, so lets hope it helps me too! I've picked up my hexagon blanket again, which I started early last year. It's still very much a work in progress! but I quite enjoy picking it up and putting it down when the mood takes me. Hope your all enjoying a lovely week. Thank you for your lovely comments I so enjoy reading them. I hope the weather improves soon. I used to have one of those burners and lots of melty things but I think I lost them in a move somewhere along the way. I have no idea where they went! How fun to be working on your wedding, I look forward to hearing all about it, so please share! I love to burn oils too, it's a lovely way to scent home, my favourite scent within lots of them is Sandalwood I just love it. You are so, so busy. I need to pop out and get that magazine, who doesn't love Lucy? Sending you warmth and lots of sunshine from Nigeria. A very happy and prosperous new year to you and yours, may 2014 be the best year yet for you. Oh I may have to get that magazine now! I am really missing my daughter this week too...she went back to school on Monday. Hope you have a lovely week and that the weather improves. Hello FB, you're certainly keeping yourself busy but still, you will miss your girl! I hope you didn't suffer much damage in all that bad weather over there, it's been dreadful hasn't it! Your 'melts' look interesting - I burn essential oils in my burner and the wonderful smell throughout the house is so therapeutic - we must have good smells around us! It's a hugs task prepping for a wedding but just take a step at a time and it'll all be just fine! CAL Spring Flowers and Lurgy!